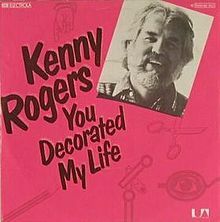 On 5 January 1980, “You Decorated My Life” by Kenny Rogers was at #97, its highest position in the 80s. Its peak position was #7 in 1979. Kenny Rogers is a lot more representative of the months bridging 1979 and 1980 than are The Police. Music in the late 70s was pretty rudderless; people had started to hate disco, rock was still largely caught up in glam, punk was too aggressive and noisy to gain a popular following, and much of what was left were ballads that sat at the confluence of pop, rock, folk, and country. Not all of the music that fits these categories was bad, but a lot of it was. “You Decorated My Life” would be a particularly dreadful representative of the badness that results when popular culture lacks a creative edge, if it weren’t for the merciful fact that it’s totally forgettable. I say it’s dreadful because the lyrics are such utter nonsense that I have to wonder how Rogers can sing it with out cracking up. We know he can, because there’s concert footage of him singing “by painting your love all over my heart” without so much as a curl of the corner of his mouth. He’s singing a love song to the interior designer of his dreams, who excels in bringing the clichés of harmony, color, and rhyme and reason into the lives of the dull. And to top it off, there’s a world where dreams are a part… but Kenny doesn’t tell us what they’re a part of. We hardly notice as the soft schmaltzy music rises in a wave of bathos, because we’re wondering, (or at least I am) whether he’s too overwhelmed to finish the thought, or if his grammar’s just lacking. And then it’s over. On the one hand, it being over is a good thing, but on the other hand, it’s hard to even notice that it’s over, because musically, “You Decorated My Heart” is really boring. It’s trying to be a touching slow dance number, presumably for burgeoning lovers to sway back and forth to effortlessly while they concentrate on how nice each other look, but even at only three and a half minutes, I have trouble imagining a couple not deciding their time is better spent mumbling sweet nothings to each other over by the punch bowl. I’m not a big fan of dramatic key changes or unnecessary saxophone solos, but I accept that they serve a purpose: to distinguish the songs they’re in from other songs, to give you something to remember. “You Decorated My Heart” has none of that. I’ve listened to it five or six times now in the last few days and I can’t recreate the melody in my head because it’s so mundane and uninteresting. For a song about a person bringing color, music, rhyme, and reason to another person’s life, it’s the sonic equivalent of beige.